This splendid quilt of Valor belongs to my friend Jody (Goddess). It's based on Quiltville's Carolina Crossroads. 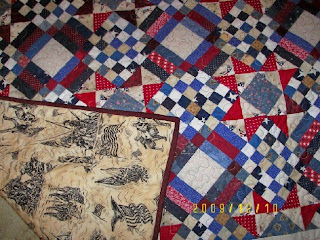 Jody makes quilts like nobodys business, in addition to a full-time job, and ranching and ...! (That's why I add "Goddess" after her name.) These are being sent to AliciaQuilts in Colorado, and then on to a hospitalized soldier wounded in Iraq or Afghanistan. These unfortunate young men and women did NOT ask to be hospitalized in addition to their military service. With these QOV quilts, they will know 'someone, out there' appreciates them. Jody (no blog) machine quilts on a frame using a regular sewing machine. Look at this little squiggle with the stars -- too clever. 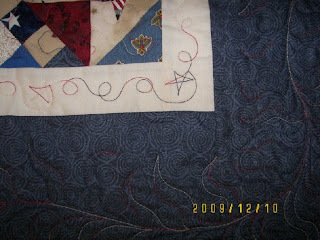 The wide border is quilted with a variegated red/blue in a viney undulating pattern, free form. I honestly could NOT discern the blocks until Jody pointed them out to me. The other best part is the backing - it's filled with a variety of U.S. historical motifs, from early history to current. Gorgeous - and she found the fabric at discount price! Thanks, Jody, for being so generous with your talents, and for allowing me to show off your beautiful quilt. that is going to be quite the treasure for one of our deserving soldiers! Jody shows great appreciation and dedication. May she be blessed for this effort. Pass along a hug from me. The quilt is beautiful. Bless all who prepare these hugs for our soldiers. Fantastic job on the mystery pattern and a very generous gift! Jody has a good soul. That quilt is going to be a good asset to Alycia's quilt drive. This quilt looks great! 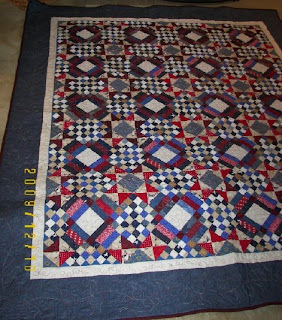 I have it on my list of quilts I want to make...lots of little pieces, but so gorgeous! Simply amazing. Amazing quilt, amazing work from an amazing person. You know some pretty cool people, Elaine. Since like attracts like - I reckon that's one more vote for you being amazing, too! hee. Warmly, *karendianne. It is just so pretty, and I know will be loved by a soldier somewhere!